These cards are now recommended by guitar teachers. Other guitar flash cards on the market cover the first 5 frets of the guitar, and show some common guitar chords and symbols. These 78 cards cover all the notes on the guitar up through the 12th fret. Using guitar tablature is fine, up to a point, but you can learn all the notes of your guitar by using these 78 flash cards. Test yourself with just a few cards a day, every day. It's similar to using flash cards to learn a foreign language, after a while you will discover that you will be able to glance at a note on your piece of music and know immediately where it is on the guitar. Trying to memorize notes fret by fret can be a struggle and it's the flash card system that can give the best results! I am a Suzuki dad and I used these cards on my son (12 yrs old). I am so impressed with the set up of these cards and my son has been so much rewarded. Just great that he can recognise the note on the staff and name it and play it. It is very well thought out and designed. It is the best flash cards I know off in the market. Without hesitation I will recommend this to other Suzuki families. Philip is so helpful too. This is a nice set of Flash Cards to help learn the guitar fret board. It is good that the cards are divided into groups.. Open strings through Fret 4. Fret 5 through 8. Fret 9 through 12. The user can also further divide the groups by strings. For example the absolute beginner can make a group of cards that cover only the natural notes of E, F and G on the high E string and combine with B, C, D of the second string. Once they are totally comfortable with those six notes and are ready for the G string...then add the G and A. Later, add D, E, F etc. Breaking down a daunting task of memorizing ALL notes on the guitar fingerboard to small bite sized chunks makes sense. The flash cards can be used as a game for smaller children or as a self teaching learning tool by adult learner. I am using them with my students and recommend they purchase a set of their own. what I discovered is a remarkably simple, yet highly effective little device designed to teach the guitar student, whether beginning or more advanced, all the notes on the fingerboard without expending, as I did, two entire years learning from guitar methods. Practicing four hours per day, it took me over two years to become comfortable reading and playing all the notes on the guitar fingerboard. Using "Philip's learn ALL the notes on the guitar flash cards" one could quite easily learn what took me over TWO years to learn in less than one! It is a method that is fun to use and one needn't even have the guitar with him or her in order to "Practice". I am a professional performer on the guitar and I am convinced that this is the easiest and fastest method out there for learning the notes on the guitar neck without blood, sweat OR tears. I've been playing guitar for nearly 50 years and taught myself to read music during that time. Having said that, I was impressed by the clarity of execution and principle behind these flash cards. I worked through them for fun and, experienced as I am, still made the odd slip here and there! Just wish I'd had these when I was starting out on the instrument all those years ago. 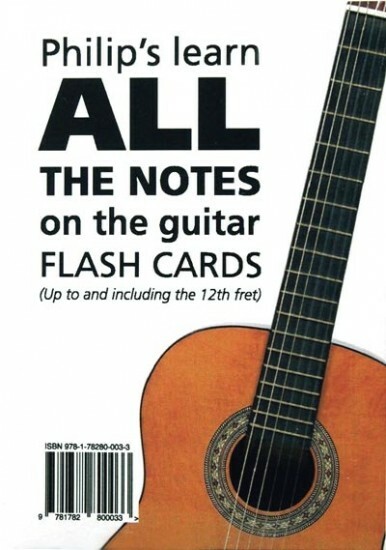 I am one of the guitar teachers who is happy to recommend these flash cards. It's true that if you only ever want to strum some songs around the campfire (and there's nothing wrong with that), it's not necessary to learn the positions of notes higher up the neck. But anyone with ambitions as a classical or fingerstyle instrumental guitarist will find that learning where these notes are will help their playing enormously. Philip's flash cards are the best and simplest resource I've seen for this. I thoroughly recommend them.